We are now entering one of the astrological high-impact zones of the year. Mars will oppose Pluto and square Uranus. Mars is symbolic of drive and energy, Pluto rules big power, big money and taxes, and Uranus is representative of "the little guy" demanding a fair go and radical reform. We've discussed these many times in the past few years because of the long-running square aspect between Uranus and Pluto. It'll start to get even more intense this week when Venus squares Saturn, an aspect the big guy, Jupiter, will repeat in early August. And Venus, the ruler of money, material values and diplomatic relations, will soon go retrograde. In Forecast 2015, published in January and available in the Archives, I outlined this period from mid-July to early-August with a heavy red border and indicated it was one of three periods likely to be significant for stock prices. It has already been triggered by the passage of the Sun, but is about to get potentially even nastier. 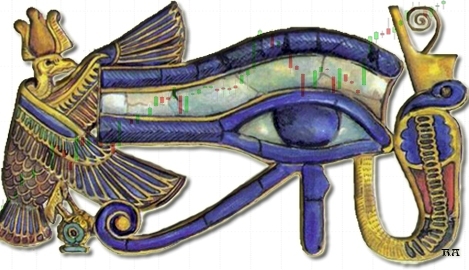 Let's not worry ourselves too much about trying to predict the outcome of the astrological transits and, instead, take a look at where we are, primarily with Wall Street's SP500. In March, I warned that the 500 was about to start running into a series of primary, downtrending planet lines likely to heavily stall the rally. Incidentally, the same thing will happen to the Australian stock market in the next couple of weeks, but I'll deal with that later in this edition. In the June edition, I indicated traders had to keep a close eye on a primary Pluto level of $2084 for the Pollyanna index (SP500). 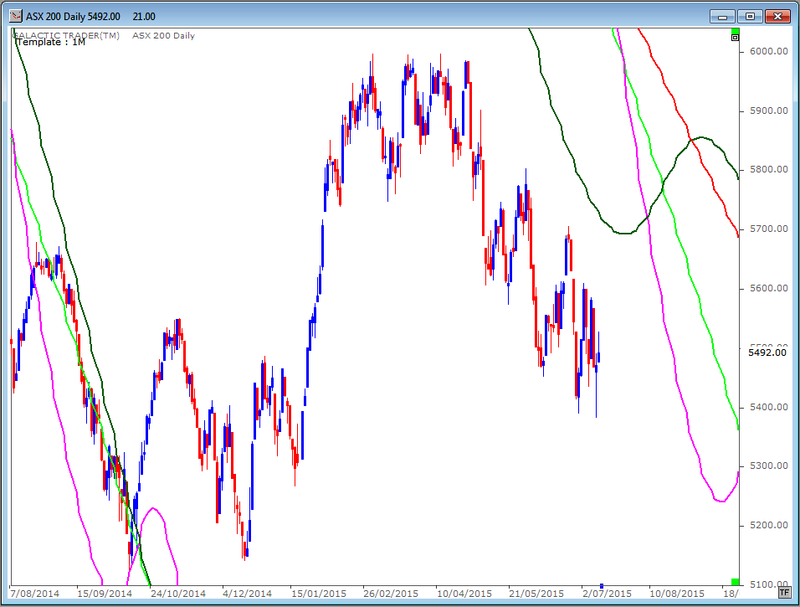 It lost the support of that line and is now on its third attempt to retest it from the downside. Strong recovery, especially on a weekly basis, could see Wall Street launch into a rally likely to take it to $2180 or higher. A failure to do so will see prices drop back down under the influence of the falling primary planet lines. Remember that we are now in the weakest portion of the stock market year and the "sell in May" theory may be taking effect, with a decline all the way to October. The chart below shows Pollyanna's long-range planetary price lines and a continued decline could see it drop a lot further yet. 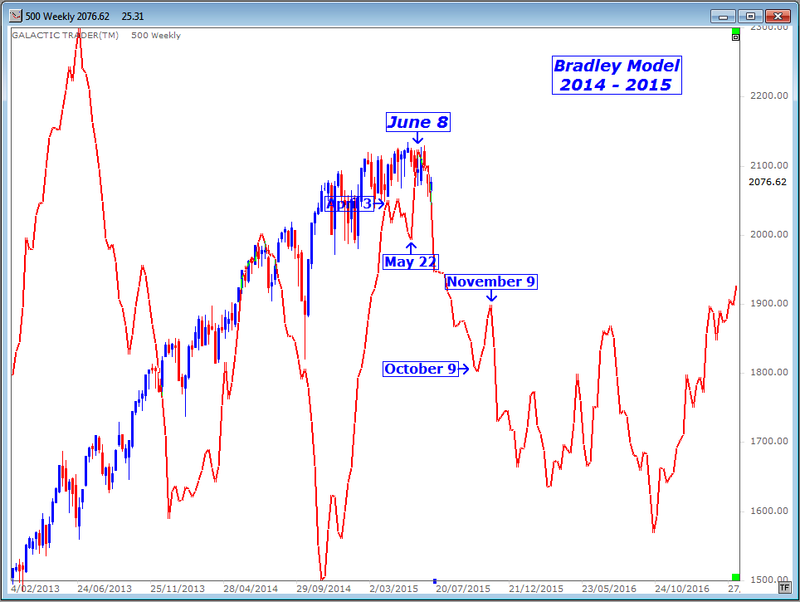 Forecast 2015 also listed the major Bradley Model turn dates for the year ... and this is what has been happening, so far. 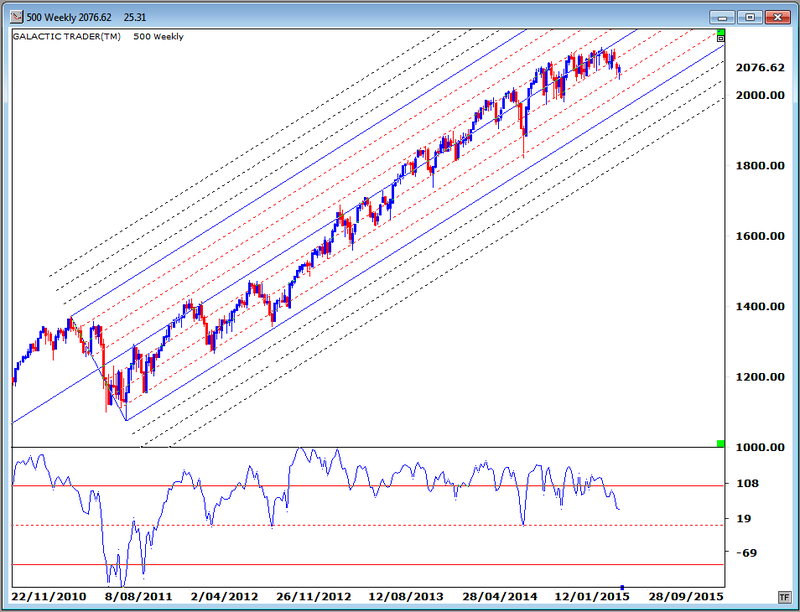 I always warn you it is the dates which are important, not the direction nor the amplitude of the trend change. April 3 was two days off a low; May 22 was one day off the all-time closing high; June 8 was one day off a low. The next major turn date doesn't arrive until early October, though there are two minor dates in the next couple of weeks during this high-energy astrological zone. Now, let's take a technical look at how Pollyanna is holding up. 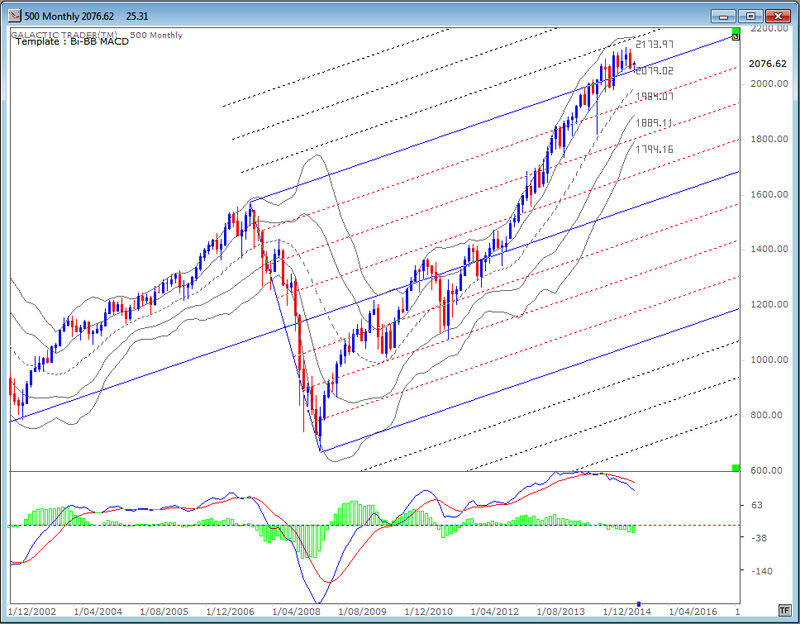 Below is the long-range monthly Bi-BB chart, using a fast MACD as the oscillator and showing a trend pitchfork. 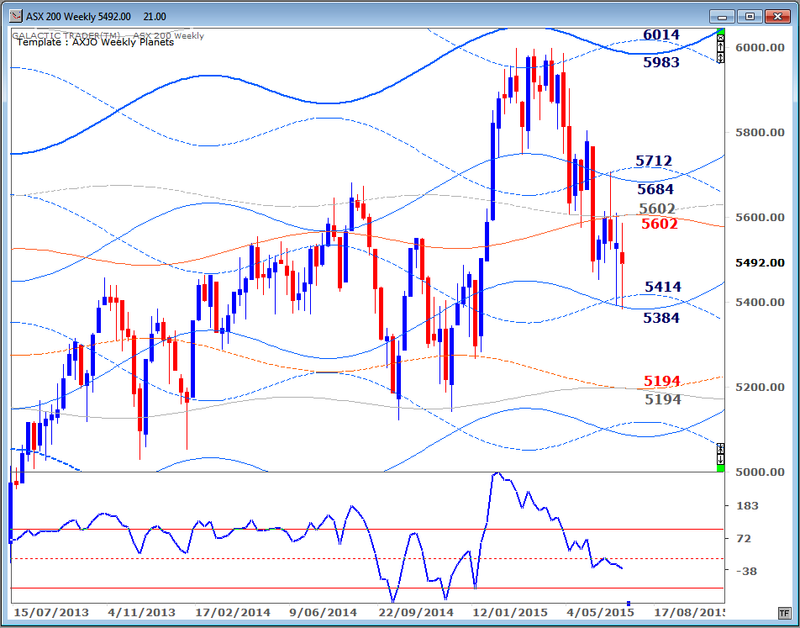 For the past few years, the 500's prices have travelled very strongly within the upper tier of the monthly Bi-BBs. This very useful technique is outlined in The Technical Section of The Idiot & The Moon. As well as that, Polly has been trying valiantly to ride along the top edge of the major, blue tyne of the pitchfork. We are starting to see signs of deterioration in the strength of that advance ... and with negative divergence in both the MACD signal lines and histograms. 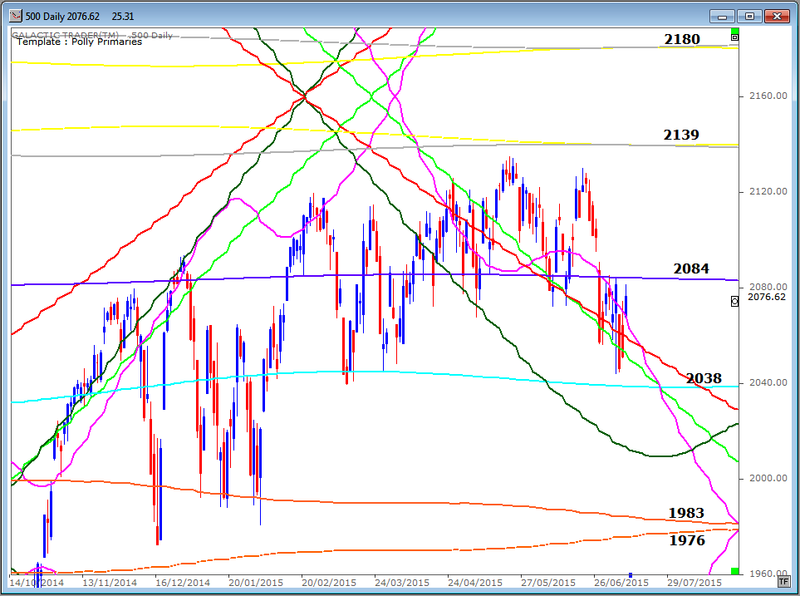 The deterioration is also evident in a weekly chart, where the pitchfork's tynes are anchored at the first major correction after the Bear bottomed in 2009. The angle of the uptrend continues to hold, but price is finding it increasingly difficult to sustain ... and the Big Bird oscillator doesn't seem convinced that the current correction has completed. In short, we all need to be very careful in these few weeks into early August. That might be particularly true for the Australian market. It is now facing the same problem which has thwarted the Wall Street rallies in recent months ... a heavy set of downtrending inner planet lines almost immediately ahead. If you take a quick eyeball at the left-hand side of the chart, you get an idea of what contact with these once-a-year downtrend lines can do to the index! 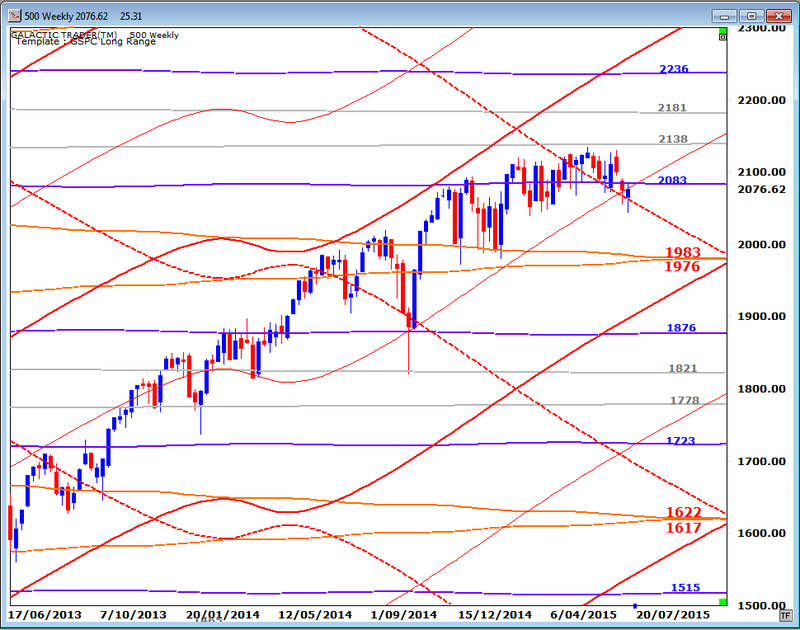 The trouble will come if the index rises into around $5700 by the end of the month. During all the volatility of the past couple of months, the ASX 200 has been routinely playing with blue Saturn price lines on its Weekly Planets chart. The Big Bird oscillator isn't hopeful, at this stage ... and you can see the resistance around the $5700 level is also emphasised on this chart. In any case, these price targets have been working exceptionally well for weeks now ... for initiating Longs or Shorts!